Yesterday I was working on a fresh install of Sitecore 9.1 and followed the documentation for JSS with vue. Everything was fine. I was able to connect my local app with my Sitecore. The API Key return a json. 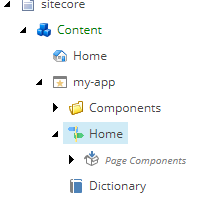 Then I started to add new components and made a deploy package. In the Content Editor I can see my app, and all components inside. It looks like the relevant error is this: window is not defined. Do you have any first or third-party components that are attempting to use window? If it's a component you control, I would suggest adding a conditional statement around your usage of window, e.g. How I fixed this error.